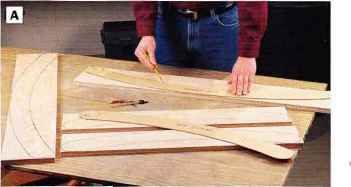 PHOTO A: Create seat and bach support templates from hardboard, and use these templates to draw the profiles on the back and seat support workpieces (use treated lumber, not plywood as shown). Cut out the parts with a jig saw. O Cut two back supports and two seat supports to size and shape. To ensure identical pairs, use templates made from Vi-in. hardboard to trace profiles onto the workpieces (See Photo A). Follow the dimensions shown in the Back Supports and Seat Supports drawings, page 65. Before cutting out the back supports, measure and mark the centerline to use later as a reference line for crossbar installation. © Paint the supports. Sand the surfaces and edges well. Apply a coat of latex primer, then two coats of exterior latex paint. Transfer the centerline reference mark on the back supports to the painted surfaces. ©Make the slats and crossbars. Cut blanks to length from 3/4-in. oak stock. 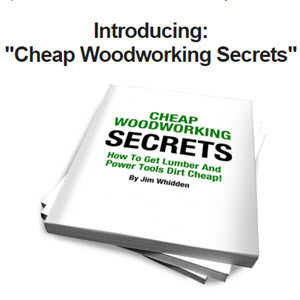 Set the fence on your table saw to rip the l-in.-wide slats and crossbars. Re-set the fence to cut the 2-in.-wide, inner long crossbar. © Drill counterbored pilot holes in the back slats and seat slats for attaching these parts to the supports later. Designate 16 slats as the back slats and the remaining nine slats for the seat. Drill a pilot hole 23/8 in. from each end of the back slats, so the counterbore portion of each hole is 3/s in. deep. This is easiest to do using a depth setting on a drill press. At the same drill press depth setting, drill a pilot hole 33/8 in. from each end of the seat slats. © Make the crossbars. Crosscut the two long crossbars and the short crossbar to length from the 1-in. stock you ripped in Step 3. Drill counterbored pilot holes for screws 3/8 in. from each end. © Rout a Vfe-in. roundover on the edges and ends of one face of the slats and crossbars (See Photo B). The proportions of these parts are too narrow to rout "freehand" with a router, so shape these parts on a router table with a pin-style guide installed. PHOTO B: Ease the edges and ends of the slats and crossbars with a V8-in, roundover bit in the router table. 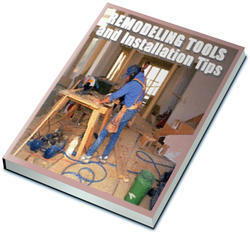 Use a pin-style guide on the router table to help control the workpieces as you machine them. © Rout a "handle" in the adjoining edges of two back slats (See Back & Handle Slats, page 65), using a V2-in. straight bit in the router table and cutting a 3/8 x 4-in. centered notch in both slats (See Photo C). © Cut two 17V2-in.-long spacers from scrap, and clamp them between the back supports to hold the supports in place. Use a carpenter's square to verify that the ends of the supports are even with one another. Set the assembly concave-side-up. PHOTO C: Make handle cutouts in two back slats using a router table and straight bit. 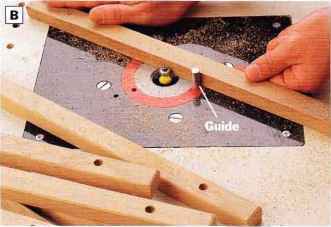 Install start- and stopblocks to limit the length of cut when routing these recesses. PHOTO D: When installing the back and seat slats to the supports, clamp scrap spacers between the supports to keep them aligned. PHOTO E: Cover exposed screw heads on the slats and crossbars with oak plugs. Glue and insert the plugs, trim them and sand smooth. 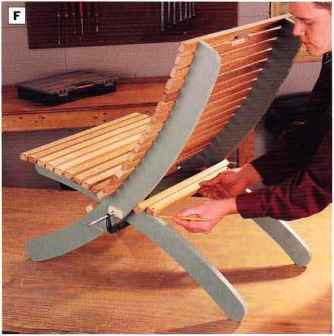 PHOTO F: Slide the seat assembly into the back assembly and use C-clamps to hold the chair together. Set the short crossbar against the lower long crossbar, mark its position, and install it with screws. © Screw the front seat slat in place, with the edge flush with the top corners of the seat supports. © Measure 123/8 in. from the attached seat slat, and mark the location of the last seat slat. Screw this slat in place. © Verify the spacing of the remaining seat slats (approximately 3/8 in. ), and attach the rest of the slats with lV2-in. galvanized deck screws (See Photo D). ©Plug all of the screw holes. Cut 3/8-in.-dia. oak plugs with a plug cutter. Glue and tap the plugs into place (See Photo E). Trim and sand the plugs flush. © Attach the outer long crossbar in place on the back support centerline you drew in Step 1. Supports drawing, page 65) and mark the location of the lowest back slat. Screw this slat in place. © Verify the spacing of the remaining back slats between the top and bottom slats (about V2 in.). Attach these 15 back slats with lV2-in. galvanized deck screws, starting from the top with the slat that completes the handle cutout. © Install the inner long crossbar. Measure 35/s in. from the lowest back slat to position the crossbar. Screw the crossbar in place. © Slide the seat into position between the back supports. Use C-clamps at the intersections of the supports to hold the two assemblies in place. Mark the correct locations for the short crossbar (See Photo F). It should rest against the outer long crossbar. Attach the crossbar with galvanized deck screws. Then plug, trim and sand the crossbar screw holes. © Break all edges on the raw oak parts thoroughly with sandpaper. Mask off the painted surfaces of the supports, and cover the slats with Danish oil or a UV protectant sealer.